Over the past 10 years I have had numerous dealings with TMD Online and have found them to be very helpful, easy to work with and very responsive to any suggestions, recommendations or changes that I have needed to make. I thoroughly recommend TMD to anyone that is in need of a professional web designer. Shim Jang Taekwondo plans to use TMD well in to the future and we look forward to working with TMD who are assisting us to showcase our art to people throughout the world. 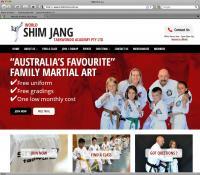 Shimjang Taekwondo is an Australian Taekwondo training academy with over 4000 members in over 65 clubs nationwide. Shimjang needed an online system that could literally run the organisation. Specifically they wanted a system that allowed the management of members from signup, through to management of gradings , licencing of instructors and management of payment, accounts and invoicing. We took a whole of organisation approach, and recognised that although a member may start off as a “white belt”, one day they may become a class instructor, through to a master instructor (and the inherent responsibilities that come with this). We designed a system that not only provided a seamless transition as the member moves through this process, but also developed key reports to allow Shimjang management to easily monitor and action changes. Online signup system, allowing members to signup, be recommended their closest classes (and allow them to choose one) and make payment via credit card. Ability for members to purchase merchandise via credit card. Maintain class information on the website. 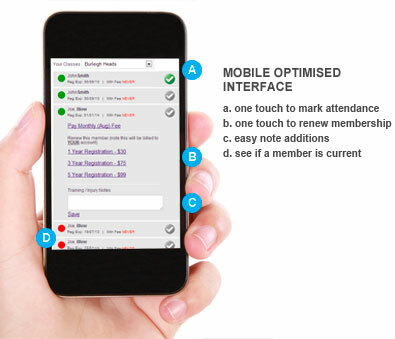 Mark a class attendance roll in realtime (see image below), using a special interface specifically geared to smart phones. During this roll attendance, instructors can see if members are current (useful when a student is visiting another class). Online licensing testing for instructors. Development of key reminders – so students / instructors / examiners are reminded of key milestones.